Virgin Media wanted an SMS job management and scheduling system for their field service engineers that would enable them request data relating to each installation via SMS from their call centre. Field engineers were previously reporting waiting times of up to 40 minutes per call which was significantly reducing their productivity and the numbers of installations they could complete per day. To create an SMS job management system that would efficiently record all inbound and outbound messages and archive old requests. For incoming requests Virgin Media required a system that would allow an instant reply through a pop up box, use of keywords for specific requests and a system to indicate to all call centre staff what requests are being handled. 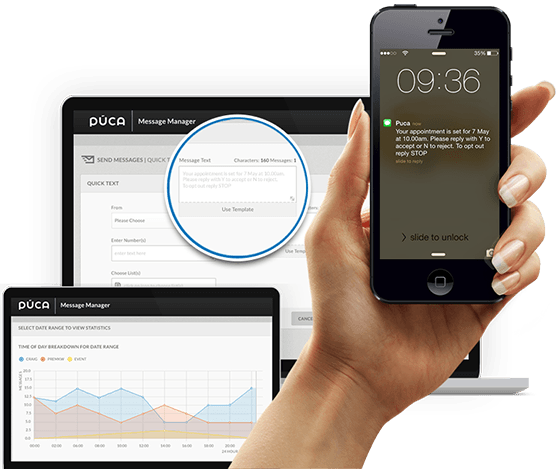 Púca developed a custom version of their Message Manager system for Virgin Media which enables the call centre to effectively communicate with staff and vice versa. Inbound SMS requests can be easily monitored and handled with SMS keyword functionality for efficient distribution of messages to personnel. All jobs and related responses can be tracked and archived and all inbound and outbound messages managed effectively. Our field engineers now communicate with our contact centre in a much more efficient manner and the system has proven very easy to use and manage.